The mission of the Southwestern School District is to develop students' potential for positive contributions to society as self-sustaining individuals. To accomplish this mission, the administration and staff will be models in the pursuit of excellence and will provide appropriate learning environments which encourage respect for self, others, school and community. The Southwestern Central School District serves approximately 1,500 students. Our district is comprised of three buildings. Southwestern Elementary School, which opened in September 2002, has 687students enrolled in grades Pre-K-5; the Middle School serves 326 students in grades 6-8, and at the High School there are 477 students in grades 9-12. Employment in the district is comprised of 129 faculty members and 76 non-instructional personnel. There are principals in each of the three schools with an assistant principal for grades K-12. The Southwestern Central School District is distinguished by a well-educated faculty that is committed to excellence. Parent and community participation and support is acknowledged as essential to maintaining an environment for effective learning. 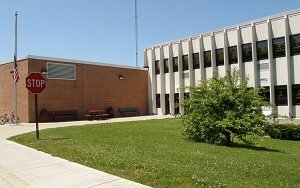 The Southwestern Central School District is located on the west end of the city of Jamestown, New York. Included in the district are the villages of Lakewood and Celoron, the Town of Busti, rural areas and the suburban area of West Ellicott. Jamestown and the surrounding area comprise a population of approximately 60,000 people located 40 miles east of Erie, Pa. and 70 miles southwest of Buffalo. People who work in professional, business, industrial and agricultural occupations reside in the district. Transportation and housing facilities in the area are good with a shuttle air service connecting Jamestown to Cleveland. A hospital and several clinics are in the area. There are many residential areas to fit the needs of the owners and all are located near shopping and business districts, including a mall in Lakewood. There are approximately 50 houses of worship that include 19 denominations and provide a local abundance of churches for the population. Year-round outdoor recreation abounds throughout the Chautauqua Lake area. Excellent hunting and fishing plus many areas suitable for hiking and horseback riding add to the fine golf courses, ski resorts, state parks and the famous Chautauqua Institution that attracts world leaders in the fields of music, medicine, politics, the press and religion. The Jamestown Concert Association, Reg Lenna Civic Center and Little Theatre provide entertainment year-long and there are several museums in the area. Service clubs and fraternal organizations are active in the community and the area is served by Jamestown Community College and Jamestown Business College. Several four-year institutions of higher education are within a 70-mile radius. The Southwestern Central School District community is one that is excellent for both individual and family living.